Dr Andrew Rochford, respected health commentator and 2004 winner of The Block, shares his tips for future-proofing your home. It wasn’t that long ago that future-proofing your bathroom meant being forced to choose from hospital-like stainless steel and ugly plastic add-ons. Fortunately for home-owners looking to ensure their home works as well for them in the future as it does now, those days are over. You can now renovate your bathroom for your future needs, while getting all the benefits of a great-looking room right now. It may sound like an unusual renovation consideration, but with one in every three over-65s experiencing a fall each year, many Baby Boomers are considering age-proofing renovations – either for their parents, who want to continue to live independently in their own homes for as long as possible, or to ensure that they personally can remain in the home they love. And the bathroom is a great place to start because the combination of water and smooth surfaces make it one of the most dangerous rooms in the house when it comes to fall-risk. Andrew Rochford, the 2004 winner of TV series The Block, respected health commentator and avid renovator, has some helpful tips that will ensure your house remains more home-sweet-home than nursing home – including some clever bathroom innovations for older Australians by Caroma that can help you do just that! “Everybody wants a bathroom that’s stylish and that fits in with the décor of the rest of their house,” Andrew says, noting that it’s matter of finding products that will do the job while also fitting seamlessly into your home’s aesthetic. The TV presenter is a big fan of the Caroma Care range, which was specifically designed by Caroma to ensure that older Australians were supported in their desire to live safely in their own homes, without having to compromise on appearances. Would you know at first glance that this Caroma Care bathroom was an age-assisted bathroom? The creation of specialised yet stylish ranges such as Caroma Care also means there is no need to fear that an age-proofed bathroom renovation will damage the value of your property. If you have mobility or joint issues or develop them later in life, the simple act of going to the toilet can become a real pain – literally – because it involves using several joints. 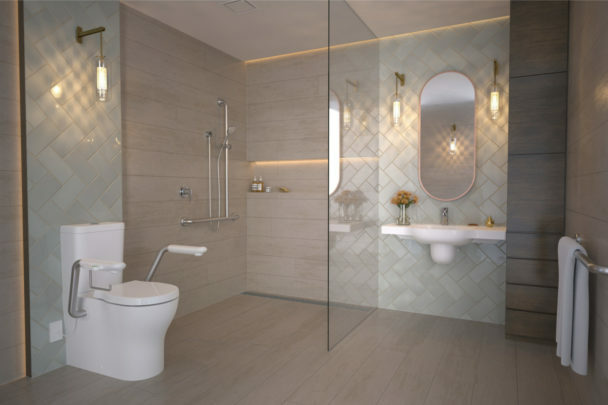 Something as simple as a taller toilet, though, can make a real difference to how useable your bathroom remains, because it’s easier to move from a standing to seated position and back again from a higher position. “An easy height toilet reduces the strain on your knees, your hips and your lower back, which reduces the risk of pain later in life,” Andrew says. 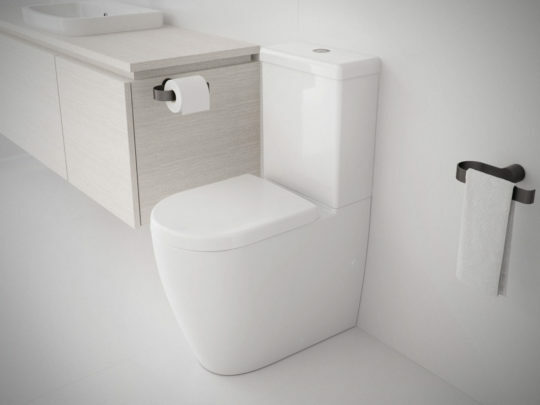 There’s a range of toilets called Easy Height – stocked by Caroma in numerous styles – that are 4cm higher than a standard toilet, and those 4cm can make a big difference when it comes to ease of use. Thinking taller when it comes to toilets could save you trouble in the future. Ease of maintenance should be a key consideration when selecting furnishings for the home you want to live in long-term, Andrew says, so it’s advisable to avoid fittings that will require a lot of stooping or kneeling to clean as this can cause pain in tender joints. Again, the standard-setting designers at the Caroma have an innovative solution. Caroma’s Cleanflush toilet won the company a Good Design Award in 2016 for its rimless design that leaves nowhere for germs to hide and higher-powered flushing that means the toilet requires no minimal cleaning. And while this may sound unlikely, there’s no splashback – as you can see in this video. 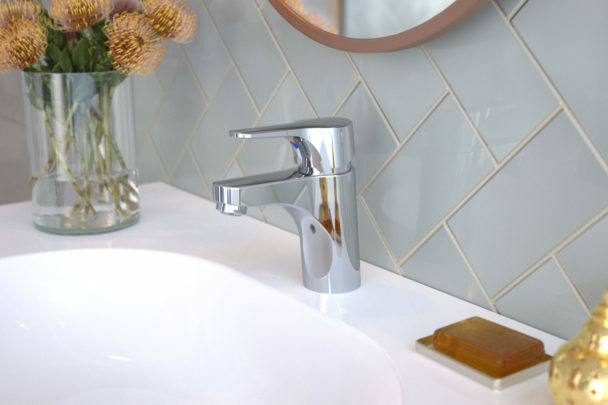 The popular doctor also recommends lever-style taps for an age-proofed bathroom, for two good reasons. Because people aged 65-plus are at greater risk of developing serious complications from the flu, it’s important that everyone in a household that includes an older Australian wash their hands regularly to avoid passing on germs. Lever taps, which are easier for everyone, including children, to turn on and off, make it more likely that everyone will be diligent hand-washers. Lever-style taps are not as hard on your wrists as traditional twist-motion taps. Also, lever tapware is easier on your joints, he points out, adding that “we don’t figure out how hard it is to turn on the tap until we’re older and our wrists are arthritic and painful” and we actually have to do it. About 30 percent of Australians over the age of 65 will experience a fall in any given year, many of them in the bathroom. While you can put in off-the-shelf safety measures such as non-slip mats right away, there are additional features you can add to your bathroom, such as grab rails, that can be even more helpful. But grab rails can look unsightly if installed as an afterthought, so a bathroom renovation is actually the perfect time to have them put in as you can ensure they match the entire room’s look. For example, the Caroma Care collection includes integrated grab rails with a similar look to the other furnishings in the range, so they blend in rather than stand out. 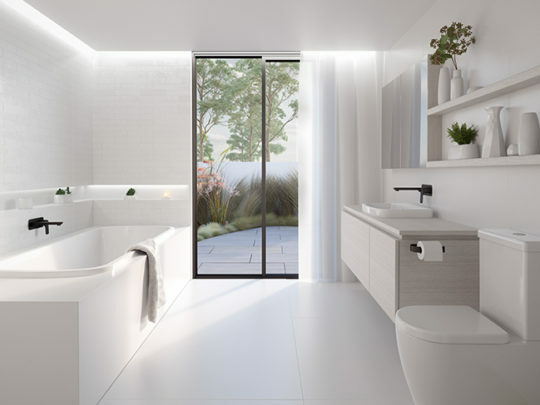 If you’re undecided about whether a bathroom renovation can make your home more serviceable AND valuable in later life, Caroma has a free, online 3D bathroom planning tool that can help you visualise how your new bathroom could look. Have you thought about how your bathroom may work for you if you had age-related health or mobility issues in the future? A patented Australian design that supports independent living with an elevated and extended pan, nurse-call features and a more hygienic bowl clean so there is less risk of germs and bacteria.